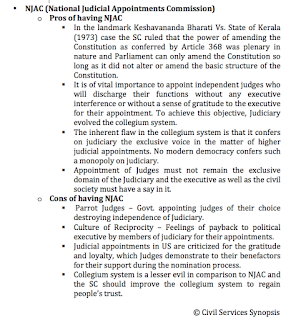 One of the hot topics for this years IAS/UPSC Civil Services Mains Examination is undoubtedly National Judicial Appointments Commission or NJAC. While UPSC may not be asking a simple "what is NJAC? ", it will be prudent to prepare well on the topic. 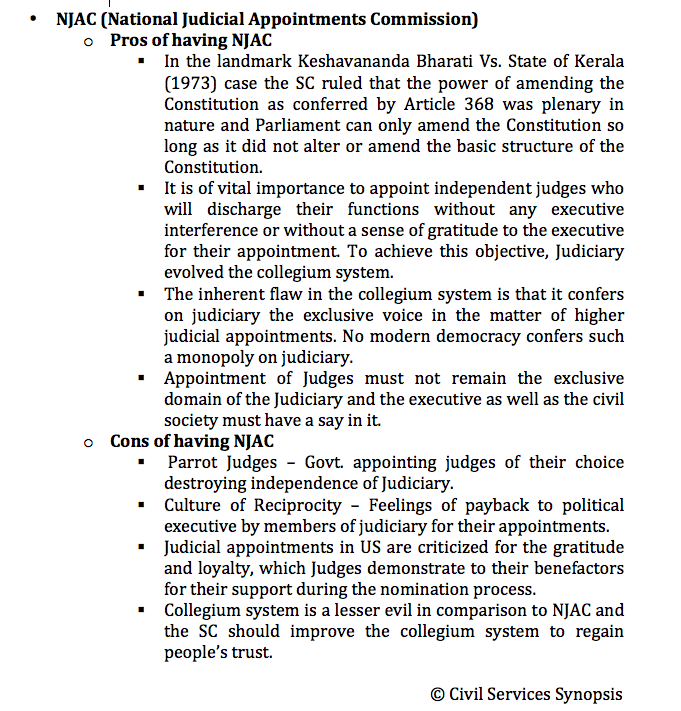 I have listed out some of the important points both in favour of NJAC and also for continuing with the existing Collegium system which can be noted or downloaded below in points format for easier understanding and retention. The aspirants should be well prepared on the Constitutional provisions governing judicial appointments, the three Judges cases that have led to the present Collegium system, the flaws in the collegium system and the pressing need for reforms, what are the issues with the composition of NJAC, what are the best practices in other countries etc. If one prepares well on all these aspects then one can write a good answer in quick time which is the demand of the UPSC IAS exam.